Tim DeBenedictis with Southern Stars has announced that Orbitrack, its iOS app for tracking satellites, is now updated to version 2.1. 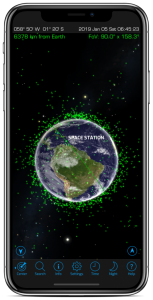 Orbitrack is a thorough rewrite of Southern Stars’ 2013 Satellite Safari app offering a brand-new, augmented-and-virtual-reality satellite tracker and spaceflight simulator. Orbitrack will tell you when spacecraft pass overhead, show you where to find them in the sky, and let you track them across the planet. The latest version offers an Augmented Reality (AR) Sky view which blends video from your phone camera, GPS, and motion sensors to display satellites as they cross your sky. There is now also more information in Satellite Info including launch dates, launch sites, categories, and countries of origin. And support for iOS 12, iPhone XR, XS, and iPad Pro has been added. The app is available from the Apple App Store for $4.99US.